For multiple-choice and true/false questions, simply press or click on what you think is the correct answer. For fill-in-the-blank questions press or click on the blank space provided. If you have difficulty answering the following questions, learn more about this topic by reading our Accounts Receivable and Bad Debts Expense (Explanation). On June 1, $800 of goods are sold with credit terms of 1/10, n/30. How much should the seller expect to receive if the buyer pays on June 8? $800 minus 1% of $800 = $800 minus $8 = $792. On June 1, $800 of goods are sold with credit terms of 1/10, n/30. On June 3 the customer returned $100 of the goods. How much should the seller expect to receive if the buyer pays on June 8? $800 minus $100 = $700 minus 1% of $700 = $693. 2% for paying 20 days early = an annual rate of 36%. , ownership of goods will transfer to the customer at the customer's dock. When the Allowance for Doubtful Accounts appears on a company's financial statements, its balance will be a __________ balance. The allowance account must be a zero or credit balance when reported on the balance sheet. On which financial statement would you expect to find Allowance for Doubtful Accounts? Which method of reporting losses on accounts receivable is required in the U.S. for income tax purposes? Which method of reporting losses on accounts receivable is to be used for financial reporting? The seller of goods that is offering credit terms of net 30 days will likely be one of its customer's __________ creditors until it receives payment. After several years of operations, a company's Bad Debts Expense for a given year is likely to be the same as its balance in Allowance for Doubtful Accounts. A company estimates that $20,000 of its $500,000 of accounts receivable will be uncollectible. Its Allowance for Doubtful Accounts presently has a credit balance of $8,000. The adjusting entry will include a __________ to the Allowance for Doubtful Accounts. The present credit balance of $8,000 must become a credit balance of $20,000. Therefore a credit of $12,000 must be entered in the Allowance account (and a debit of $12,000 must be entered in the Bad Debts Expense account). A company estimates that $20,000 of its $500,000 of accounts receivable will be uncollectible. Its Allowance for Doubtful Accounts presently has a credit balance of $18,000. The adjusting entry will include a __________ to Bad Debts Expense. Amount needed in Allowance is $20,000 minus the present amount of $18,000 = $2,000 additional credit needed in Allowance. The entry will therefore require a debit of $2,000 to Bad Debts Expense. A company estimates that $20,000 of its $500,000 of accounts receivable will be uncollectible. Its Allowance for Doubtful Accounts presently has a debit balance of $3,000. The adjusting entry will include a __________ to Allowance for Doubtful Accounts. The present debit balance of $3,000 must become a credit balance of $20,000. Therefore a credit entry of $23,000 is needed in the Allowance account (and a debit of $23,000 to Bad Debts Expense). A company is expecting thousands of credit sales transactions each week with terms of net 30 days. The company uses the allowance method and it prepares weekly financial statements. It believes that 0.001 of its credit sales will be uncollectible. The company's credit sales for its first week of operations are $500,000. The credit sales for its second week are $600,000. Since none of the accounts are due for several weeks, it is unlikely that an account will have been written off. A company's Allowance for Doubtful Accounts has a credit balance of $25,000. It learns that one of its accounts receivable amounting to $1,800 is worthless and needs to be written off. Which account should be debited for $1,800 when writing off the account? Which account should be credited for $1,800 when writing off the account? Assuming that after the account is written off, the supplier receives full payment from the customer. Which account will not be involved in the accounting entries made at the time when the payment is received? Under the direct write off method, which account is debited when a company writes off one of its accounts receivable? for the year by the average amount of accounts receivable during the year. days by the receivables turnover ratio during the year. value of the accounts receivable. 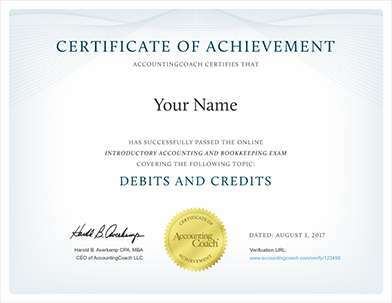 Receive instant access to our graded Quick Tests (more than 1,800 unique test questions) when you join AccountingCoach PRO.